The honors keep rolling in for the Gravitational Wave Group in the College of Arts and Sciences. Based in the Department of Physics, the group’s 22 members are among the recipients of the Special Breakthrough Prize in Fundamental Physics and the Gruber Foundation Cosmology Prize, in recognition of their contributions to the historic detection of gravitational waves. The group shares the prizes with more than a thousand other scientists, engineers and students from around the globe. The Special Breakthrough Prize comes with a $3 million award, a third of which is being distributed among the founders of the Laser Interferometer Gravitational-Wave Observatory (LIGO): Caltech’s Ronald W.P. Drever and Kip Thorne and MIT’s Rainer Weiss. The remaining $2 million is being split among 1,012 other contributors to the discovery. Syracuse faculty, students and researchers expect to share approximately $41,000. The Special Breakthrough Prize is funded by a grant from the Milner Global Foundation, named for the Russian billionaire Yuri Milner. The Cosmology Prize, which is co-sponsored by the Gruber Foundation and the International Astronomical Union, comes with $500,000 that is being divided among Drever, Thorne, and Weiss. Syracuse’s Gravitational Wave Group is co-led by Saulson; Duncan Brown, the Charles Brightman Endowed Professor of Physics; and Stefan Ballmer, associate professor of physics. On Sept. 14, 2015, LIGO’s twin observatories in Livingston, La., and Richland, Wash., picked up the fleeting vibration of a gravitational wave, equal in size to a fraction of the diameter of a subatomic particle. Over the next five months, members of the thousand-strong LIGO Scientific Collaboration, which Saulson co-founded, confirmed that the waves originated more than 1.3 billion years ago, during the final fragment of a second between the merger of two black holes. The result was the formation of a more massive single black hole. Although the Earth is awash in gravitational waves, detecting them is another matter. In fact, last fall’s detection—no more than a faint chirp, when translated to sound—marked the culmination of more than four decades of research. Brown not only developed the key detection algorithms, but also marshaled much of the computing hardware for LIGO’s discovery. Syracuse has a long history of gravitational-wave research, starting with Einstein assistant Peter Bergmann, who founded the nation’s first general relativity research group on campus after World War II. Since then, the University has attracted other stellar researchers, including Professor Emeritus Joshua Goldberg G’50, G’52, who supported the first international conference on general relativity; Roy Kerr, a mathematician who first described rotating black holes; and Abhay Ashtekar, Lee Smolin and Professor Emeritus Rafael Sorkin, all pioneers in the study of quantum gravity. Weiss, who worked out the basic ideas of LIGO as part of a physics course he taught at MIT, also has ties to Syracuse, albeit indirectly. In addition to being Ballmer’s Ph.D. supervisor, he was a postdoctoral mentor to Saulson and Gabriela González G’95, spokesperson for the LIGO Scientific Collaboration and Saulson’s first Ph.D. student at Syracuse. 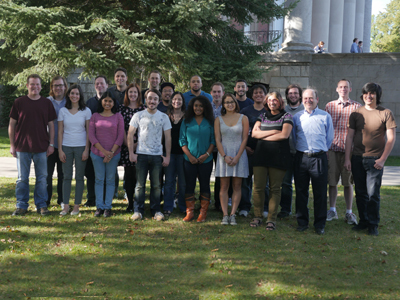 Syracuse’s Gravitational Wave Group encompasses professors, research scientists, postdocs, graduate students and undergraduates, all with a broad range of backgrounds and experiences. Saulson says that some of the researchers, including Brown and Ballmer, are already knee-deep in the next phase of LIGO.